It’s funny or strange or something to me that I’ve been sitting here for an hour mulling the words “scene/seen” over in my head and not quite figuring out what I want to write about until I decided to type in “seen quotes” into Google. Isn’t technology amazing? I knew there was a quote out there that would get me going! I’ve seen some beautiful things in my life; I think it’s fair to say we all have; but when I look at a beautiful sunset, I don’t just see it with my eyes, it surrounds me and fills me up and there are times I can’t breath from the beauty of it. 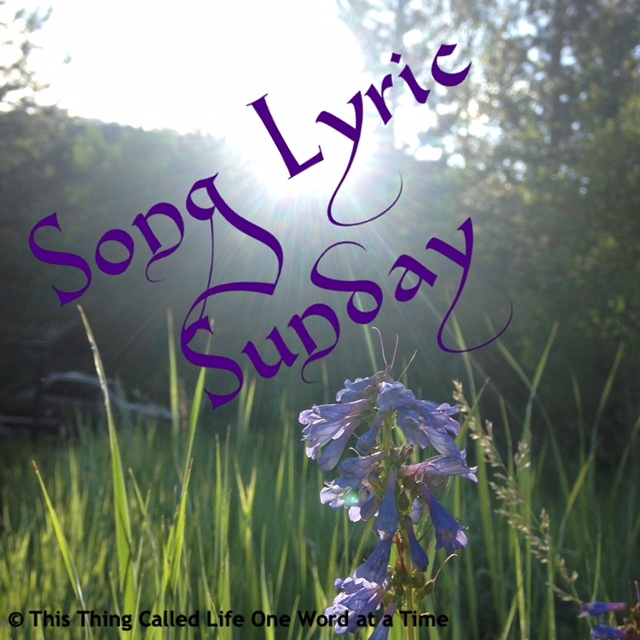 So, I’ve decided to do what Linda prompted and use photos and words to describe some beautiful things I’ve seen. Just know that photos don’t always portray what I actually saw or felt as I glimpsed the beauty this world has to offer. Most of the things I find awe-inspiring are created by nature, but there are man-made things that create beauty as well. 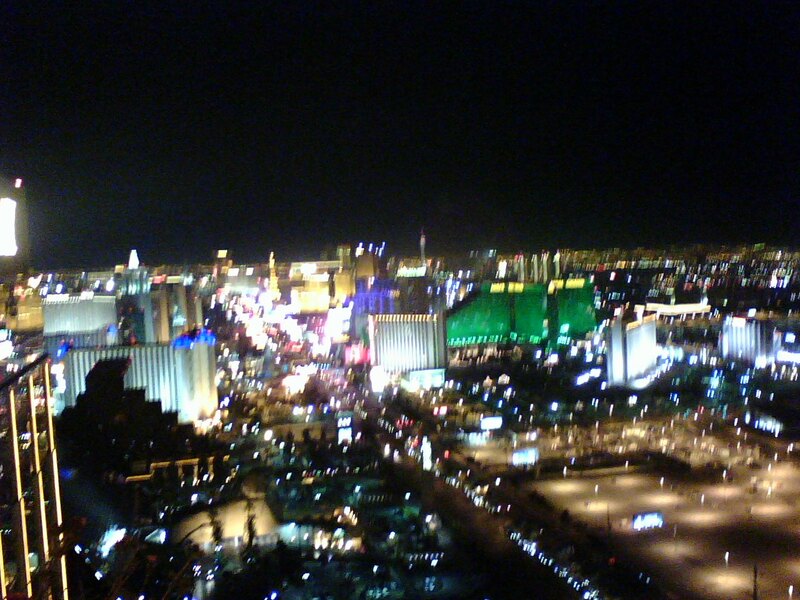 I was high a-top a casino (I can’t recall which one) in Las Vegas when I took this picture. I still wonder what it is about lights glowing in a city that can be so beautiful. We used to drive up onto the East bench in Salt Lake City at night-time just to see the lights glowing in the city below us. It’s almost like stars in the sky. I found the next photo in my older pictures and it’s one I almost forgot I took. 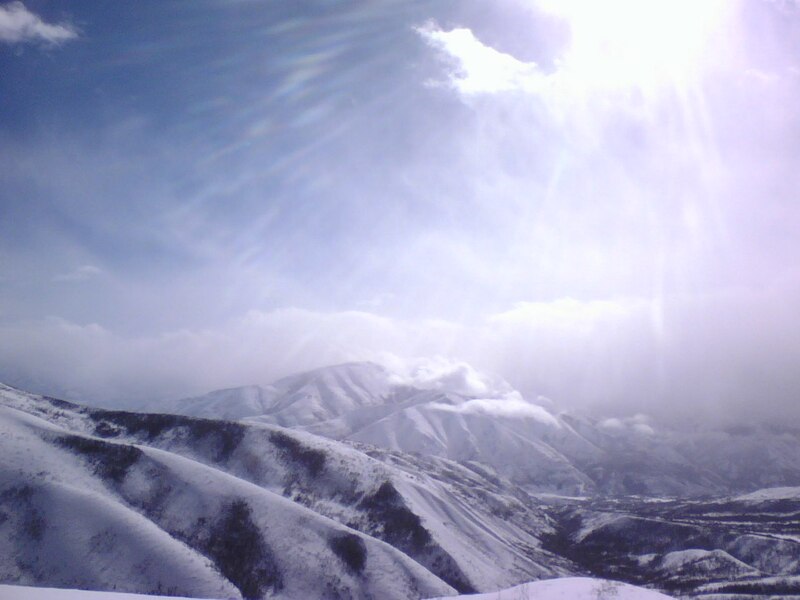 I went on a snow-mobile trip with the company I was working for and happened to snap this photo when we stopped in a more open area. I’m not sure I have any words to describe the beauty, the majesty of it. It almost feels like you are the sole person in the universe atop a snow-filled mountain peak and the glory of the sun is shining down on you. 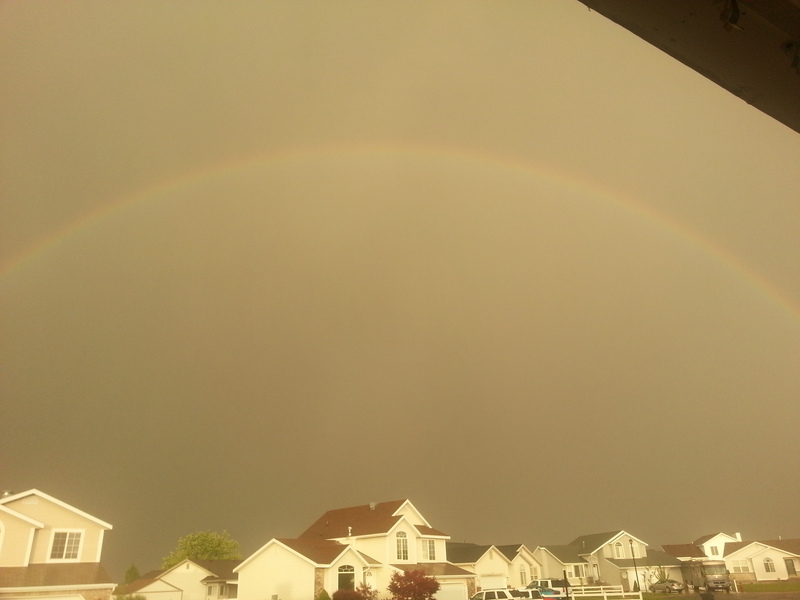 Is there anyone who doesn’t love rainbows? 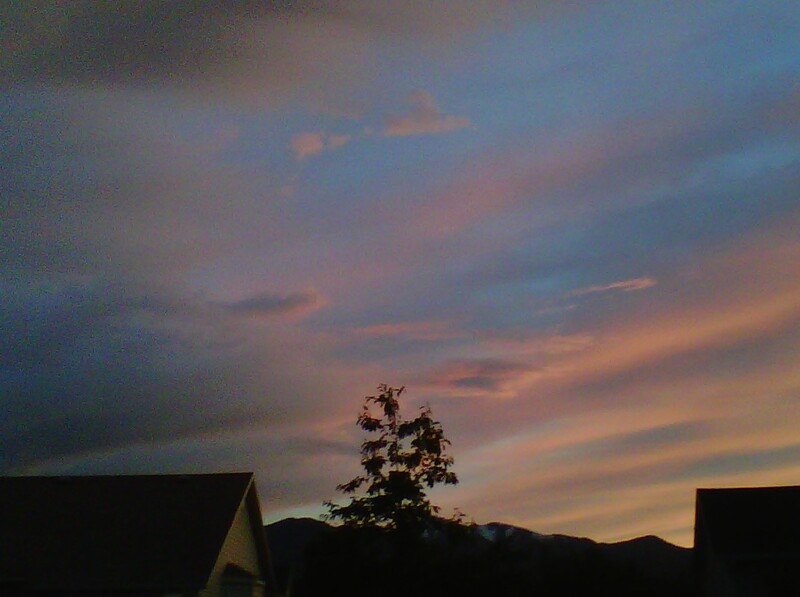 This photo isn’t the best, but I remember the sky was a strange peachy color and the air felt so still, even though it was still clogged with rain, or perhaps because of it. We see some pretty dramatic sunsets on our Mountains, but the sad thing is, the most beautiful ones come when the air is at its nastiest; if there are fires burning away somewhere close or when the inversion sets in. I’ve seen more brilliant ones than this photo shows, but I think I liked this one because I managed to get the top of a tree standing tall and forlorn against the pink-covered mountains. One of my favorite things to do is go hiking. We have many trails and plenty of mountain to hike in, I just don’t always have a buddy to go along with me. In this photo, I managed to talk my boys into a hike, but we didn’t make it to any specific destination because Jaxon’s asthma flared up and we had to turn back. This picture was taken only about an hour into the hike, but I thought it was lovely. My boyfriend went to California before Christmas in December and I was home alone for a few days. One morning, I had just gotten out of the shower and I heard a strange noise outside my window. I was pretty freaked out, but I decided to check it out anyway. When I lifted the shade, I couldn’t at first figure out what was making the strange noise, but it was loud. 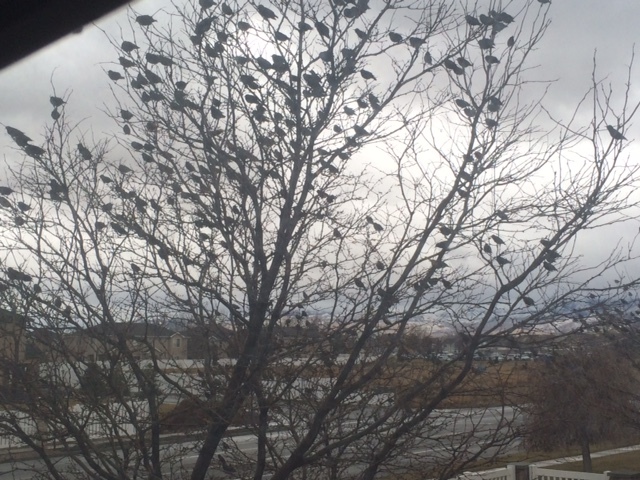 When I realized it was hundreds of birds sitting in the trees, singing and chatting, or whatever they were doing, I snapped a few photos. I still look at this photo and am amazed how beautiful it is – birds sitting in stark trees in the middle of winter. There you have it, my small glimpse into the beauty we have all around us. Pictures and moments like these help keep me grounded when all I can see is ugly darkness all around me. Things change, minute by minute, day by day and when you least expect it, beauty can shine through and brighten the darkest moments. 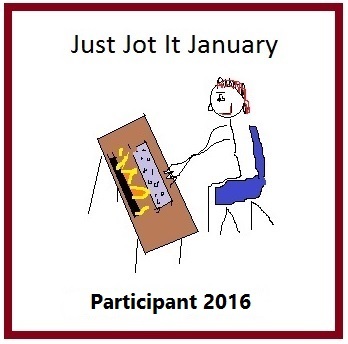 This is part of Stream of Consciousness Saturday and Just Jot It January hosted by Linda G Hill. Thanks for sharing the beauty of nature with us and your wonderful words of things that you have seen. How wonderful it is that God in his love for us created such beauty for us to love and appreciate. Hi Helen, lovely photos and yes we sometimes need to sit back and take in the beauty that is around us.